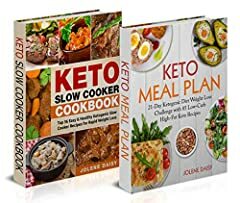 Two books are bundled: Keto Meal Plan and Keto Slow Cooker Cookbook to give you maximum benefits. The proposed meal plan based on 1400 calories per day. It is suitable for those who do not lead an active lifestyle but want to rid of excess fat and lose weight. Reap the benefits of the Ketogenic diet to lose weight and improve your health! You can also buy a full-color or black and white paperback version of this keto bundle. Just click "See all formats" section to choose your version. Look! At the end of the book, you will find a FREE GIFT! So what are you waiting for? Â© 2018 All Rights Reserved!